Alessandra: What do you hope to accomplish on your coming visit to Boruca? Don: I think we are attempting to tell the story of the community and the masks as they are. 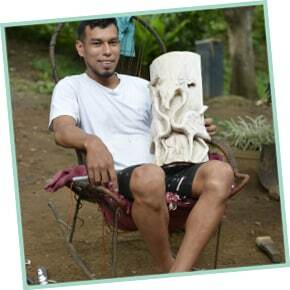 The art that comes out of this community is the result of their communal history plus the individual story of each artist. That is the story we're still trying to capture. We are outsiders and have our own views, and it's hard to get past those views and preconceptions and try to get deeper into their story, so that we can begin to get to a point where we can actually have a unique point of view of each artist. They for sure have a different definition of unique and their vision of “self” is not the same as we see it. So, in trying to have that community story combined with the one of each individual is going to take time. For this visit we hope to talk not just to the artist but also with their family, their kids, their parents and their friends. We hope to get a perspective from multiple generations. There's also the fact that the story is ever changing. The story of the Boruca art from 30 years ago, when the modern masks really began to take off, is not the same as the story of today. The economy is different, the desire to work the land is different and the future dreams of the young children is not the same as the dreams were 30 years ago. A lot has changed in 30 years. It doesn't make it less interesting; it's just a little bit different, and I think that a service we can do is to help each of them to try to discover that story. 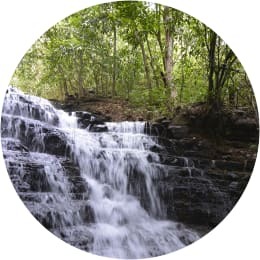 Alessandra: Today, we decided to just chill out and enjoy sitting by a waterfall surrounded by the jungle which was located just outside our hotel. It was a good idea to force ourselves to slow down before visiting with our artists in Boruca because they live at a much more gentle rhythm than ours. Alessandra: We are on the road to Boruca and we had to leave our hotel in Dominical at about 5:30 am to avoid the roadblocks due to the national strike. Alessandra: We made it! Our first stop was Currie, a town just outside of Boruca to visit Marlon who lives near the river with his wife and a 3-year-old son. Don met them last year right after their home got flooded during the October hurricane, so we were curious to see how they were doing. It is mind-blowing to even try to imagine how their home may have looked half-submerged in such high, murky water. It was my first time meeting Marlon and I was impressed by his creativity and talent. He had just started a piece showing two flamingos forming a heart, and told us the love he feels for his family inspired him--that was so cute! While we didn’t necessarily plan to record the entire process of carving a mask, we got lucky and caught Marlon just as he was beginning a new piece, so we jumped at the chance and decided to film Marlon’s process. We hope to finish recording later! 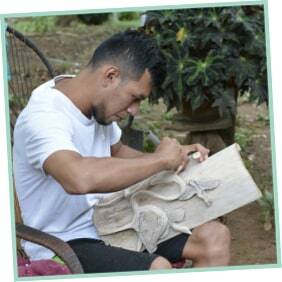 Alessandra: Later in the afternoon we returned to keep filming the finer parts of the carving and finishing touches. It was impressive, seeing Marlon carve the wings of the flamingos with such simple knives. Just through watching him work, it became clear that it takes great skill, so much attention to detail, and precision to carve those feathers! Alessandra: Today, we are meeting with 15 of the top artists from Boruca to give them a presentation to update them on this year’s exhibit and on the plans for next year. We want to give the group a chance to chat about the issues they have been facing and to motivate them to keep up with their creativity so they can continue making really nice masks for collectors. Alessandra: What was really positive for you today? Don: The meeting was very good and we had a chance to address a lot of topics. Something we're trying to understand is how to help these artists separate their art and culture from the business side of making masks. That's something they are all learning--but at different speeds. For that, I think they will have to speak openly and be honest with each other. If they're unhappy, I hope they can say so; I think there are some cultural barriers in expressing dissatisfaction among themselves. Maybe this is something they have to learn to be successful when working with various people. I also hope they will find their own way to work with different people. For their art to evolve and to get better, they will have to push each other. I think overall it's working; but certainly, some people are having more trouble adapting than others, but this is also an opportunity for us to help them. Alessandra: I'm also really happy we showed them the photos of the exhibit, masks, and shared our own effort promoting them. I was surprised that most of them had never seen those photos of the Selby exhibit before. It was wonderful because they were truly impressed with it. I hope that was a good reassurance for them and adds up to another layer of knowing why the quality is so important. I do hope now they get it--that this is real because until now, they had only heard about it. Alessandra: We talked about the future, but we need to realize that not everyone has the mindset or luxury of planning for the future--or even consider how actions taken one day may affect the next. So, we had an opportunity to explain why our demand for quality is truly in their best interest. To succeed and have work next year and the following one, they have to keep up and keep improving. If quality decreases, clients will notice, which could result in fewer orders. So hopefully they can start to understand that connection. Just having the realization that your own actions have consequences is key and we have to keep stressing it because in this community, well, every day living takes precedence and some people just don't have the luxury to think about tomorrow. Alessandra: At Marcos’ place, we got to see at least 12 beautiful pieces and got a chance to quiz him about several of them. I enjoyed hearing about his inspiration and stories behind several of his pieces. 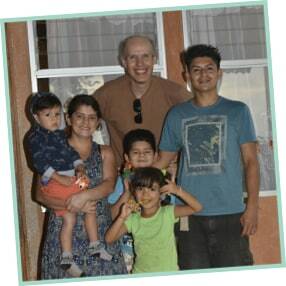 We had a good chat about his family’s future plan of bringing an eco-lodge to Boruca; we agreed that we would reserve some time this week to keep the conversation going and see if there is a chance we may be able to give them a hand. Don: Marcos showed us today that he has been keeping up with his creativity and quality. We are happy with the opportunity of potentially bringing him to the US for next year’s exhibit. Alessandra: I enjoyed chatting with Rosa, who is one of the youngest artist painters and currently the only woman we're working with. She only paints and relies on other artists to do her designs and carvings. But things may change for the better. Despite not knowing how to draw, hopefully, she got inspired enough by our conversation to take more charge of her pieces and design them herself. Her painting is really nice and a step above what I saw two years ago. She is showing passion for her art and a desire to keep learning, so I have good hope that her work will keep improving! 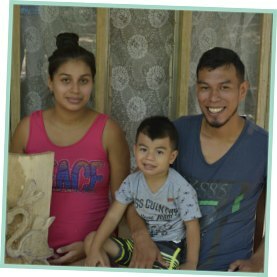 Alessandra: This afternoon we visited Esteban, a carver artist, and Margie, who recently moved to their home on the top of the hill. From a privileged position surrounded by green mountains, they enjoy breathtaking views of both sides of the valley and their place is so, so peaceful. It is a small piece of land where they have started to plant fruit trees and are growing a small vegetable garden. Currently, though, they buy most of their food. The trouble is, they have a bit water problem. When they initially got their house through a government program, the well dried out and despite promises, it hasn’t been fixed, so the neighbors lack potable water. As of now, they get a barrel of drinking water from a truck twice a week from the water company. For all their cleaning, they collect rainwater. But the dry season will come soon enough so they may have to move back to their hut in the village once they manage to repair its natural palm roof, which has started to leak after 5 years. 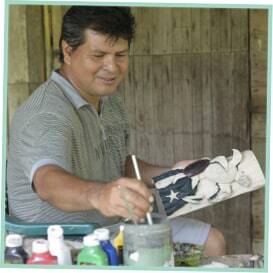 Life in Boruca goes at its own pace and it is humbling to see how easy-going they are despite their hardship. 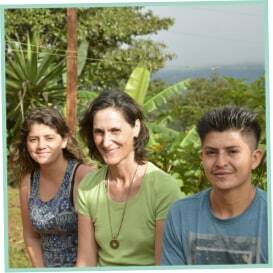 Alessandra: What can you say about our visit to Esteban? Don: Something that I noticed, and I am very happy about, is that he is maintaining his creative edge even though he doesn't draw. He has his own ideas and is doing good quality work. 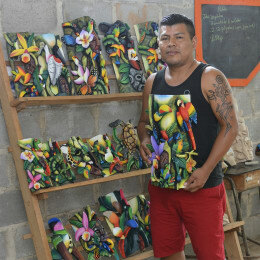 He is also working with really good painters and presenting some very nice pieces. We're looking forward to some more creative, large pieces because he definitely is trying to prove himself! Alessandra: Today we visited five artists with an ambitious plan to see their latest work face to face before shipping to the US, give them feedback, record interviews, film and take photos… With little time for each, it was challenging to play two opposite roles. On one side, Don and I are really demanding, which led to some fairly constructive criticism, which will hopefully help our artists in the long run. We know clients expect only the best of the best at the Selby Garden exhibit. On the other hand, we also need to learn more about artists and how we can better help them, so it was great to have a chance to bond, encourage, and inspire them to create even more authentic and original pieces! Alessandra: I'm happy with our visit this morning with Neftali. He is someone who has had the experience of coming 8 times to the Selby exhibit in Florida, so he understands how important it is for visitors to hear the story of each artist. He recalled how visitors quizzed him about his life in Boruca and about his art and how he got the inspiration for his pieces. He remembers also how interested people where in knowing if the depiction of the animals was as real as it could be and if those animals live near his home. So with this first-hand knowledge, it was easier to make sense of why quizzing him about his own life story can only be beneficial. 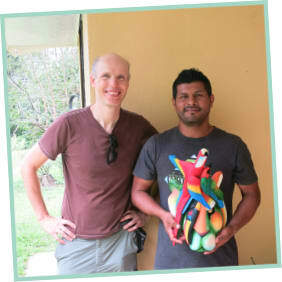 Alessandra: Then we visited with Domingo, who showed us his half-finished pieces. He enjoys painting first the background colors and then finish the fine details at once. This allowed us to film his painting technique used in a few of his pieces! I really like his use of bold colors, so it was cool to be able to see how he disperces them through the mask. 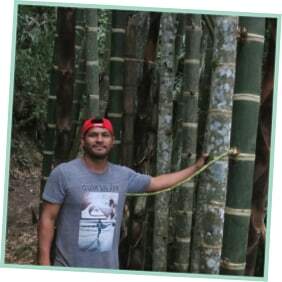 We had a good chat about his experience living in Guanacaste for three years and how he became involved with the hotel industry doing exhibits. 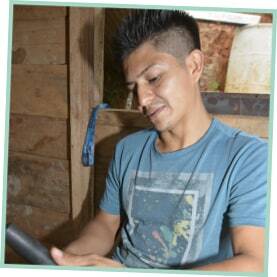 The chance to live outside of Boruca has given him a different perspective of many things. He even got to run his own gallery for some time, so he has a better understanding than others of the business side of things. 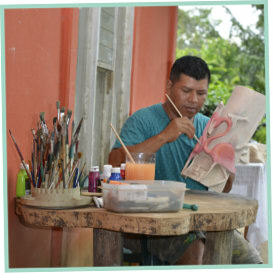 Alessandra: We got a chance to film Francisco getting started with painting of our famous flamingo mask. I had totally forgotten it was me, who, a few months ago, lightly suggested this bird to our artists… Apparently there are no flamingos in Costa Rica! Oops! At least flamingos are in Florida. Either way, I am sure someone is going to love this mask when it’s finished. Alessandra: Today we finished with our second group gathering where we had a chance to recap our experiences with all of them. We reminded them again on our key notes about quality, coordinated logistics, and said our goodbyes. The fact that we are here is so positive and I hope they know that we care about them, their art, and their futures. I feel that our encounter strengthened our bonds and brought us a better understanding. However, it also brought the communication challenges that we face to light due to significant cultural differences. Hopefully most of them felt our encouragement and took our constructive criticism well enough to make the best of the opportunities we are building together. Alessandra: After four days of intensive artist visits our minds and bodies are asking for a break! 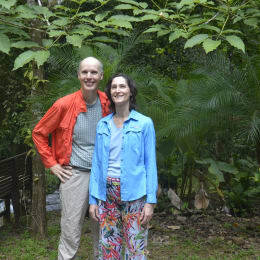 Besides, Don needs to keep a straight head and eyes wide open to keep us safe on the Costa Rican’s rough mountain roads! We are taking Friday off and will come back on Saturday for a different adventure. 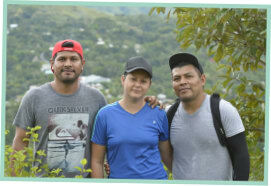 Alessandra: Today Domingo, Marcos, and his wife invited us to visit their family finca up in the mountains of Boruca and we had a wonderful time hiking together! It was surprising to see how much the ecosystem changed as we ascended. When we reached the top, we were delighted by the cloud forest, which we didn’t even know existed! There were ferns, moss and totally different trees and vegetation than the more tropical foliage below. Our friends were eager to show us this magical green place where they lived as kids before moving into town, which hadn’t been farmed for nearly 25 years. Thanks to their conservation efforts it has become a luscious young forest! After about 2 hours of steep climbing, we arrived to an open, flat spot where they are planting fruit trees and have plans to build an eco-lodge as sustainable as possible using local materials such as the bamboo that grows on their property. 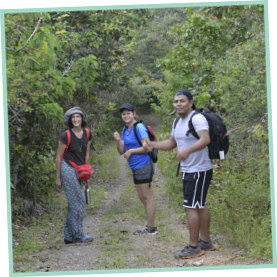 As of now, there is practically no tourist infrastructure in Boruca, so it is their goal to create a place where nature lovers, researchers of wildlife, bird lovers, anthropologists, and maybe even artists and art enthusiasts could enjoy a special time visiting this community. This place so green and alive with spectacular views all around! Our friends hope to make this spot a destination that attracts more visitors to Boruca so the whole community can benefit. It was exciting to hear about their future plans and dreams! Nature has a way of enchanting us and so this adventure left Don and me nicely recharged. Alessandra: Our visit to Boruca this week was demanding but also really productive. We got to visit one-on-one with most of our artists, learn more about their lives, interview them, take photos and video, and encourage them to keep creating. It seems that the more we learn about them, the more we feel there is still so much we don’t quite yet understand. But we are happy we did quite a bit and got to take home some really cool videos that show their amazing skill as well as some good stories to share! Alessandra: So Don, what was today’s highlight for you? Don: It was different to see the wildlife outside the village. I liked seeing the village from the top. Also it was great to get to know Marcos and Domingo a little better. So the hike was definitely a highlight in our trip. Don: We learned much more about our artists and their talents and skills during this trip and we have a lot to share in the form of videos and personal stories! I feel that our challenge now is to keep gently encouraging them to do their best and be even more creative. We realize that some of them are more aware of their own cultural roots and historic traditions than others, and that is reflected in their work. But it is clear that this is an evolving art and we are happy to be part of this adventure!